Looking for ways to keep your vinyl flooring looking clean and in great condition? Vinyl flooring has once again become popular. Vinyl can be hard wearing and can be great for high traffic areas. High traffic areas are not always easy to clean, but we have some easy to follow instructions to keep your vinyl floors looking great. Clean often, not less than twice a week is probably a good idea. First vacuum or sweep the area to remove all dust, hair or dirt. Once you have completed that, you are ready to move on to using a damp mop or microfiber mop head. 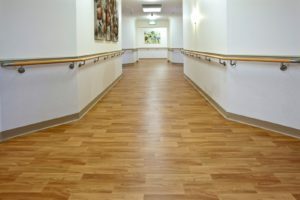 You can use a commercial cleaning chemical specifically made for vinyl flooring but if you prefer the natural cleaning way then you can make your own cleaning solution. With just a cup of white vinegar, bucket of water and a little sunlight dish washing liquid you have now created your own floor cleaning solution! Mop the floor, ensuring that you rinse the mop regularly. If you are looking to remove stains or marks from the floor, use the same mixture on a wet cloth and add little bit of baking soda to the microfiber cloth, rub the stain or mark until it comes clean. Clean once more with only the original solution to remove the baking soda. Do not use abrasive materials or steel wool to clean marks off the floor. This will surely ruin your vinyl flooring. Stay away from cleaners that leave a waxy layer on your flooring, this will build up over time and cause problems later on. At entrances, place walk off mats to prevent dirt from entering the premises. This will help keep floors cleaner for longer and also prolong the life of your flooring. For more cleaning tips and advice, visit our blog page.